I switched months and am teaching this song in August but I thought I'd hurry and post it for everyone wanting to review it this week. Thank you to the Yahoo Group member who posted this a few weeks ago! I fell in love with the idea. UPDATE: Check out my updated post HERE that includes printables thanks to Susan Fitch! Download this image of Angel Moroni HERE and enlarge it so it's maybe a little bigger than 1/4 of the page. Print it on yellow card stock and laminate it. Download this image of the Salt Lake Temple HERE (you could find a picture of your local temple as well) and blow it up to fit the entire page. With this as your guide, transfer the image onto a poster board with a Sharpie marker. I did mine by hand (it's obviously not perfect so I'm hoping the kids won't judge me!) but I'm sure you could take it in somewhere and have it printed. Bring a blindfold (I just cut a long piece of felt as that's what I had) and masking tape. I also like to post the words - mostly for teachers. Towards the end, I'll take them down. Before Primary, hang the poster board somewhere where it can be about eye level with the kids. Then you'll need some sort of aisle or space for a child to walk blindfolded. Sr. Primary: Play the game similar to pinning the tail on a donkey. 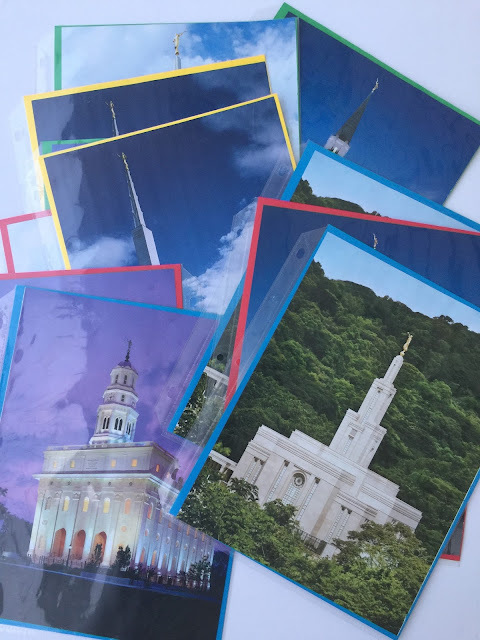 Blindfold a child and give them Moroni to tape on the temple. Spin the child and set them off in the direction they should go down the aisle. The Primary sings louder and softer to direct the child the temple. If the blindfolded child is headed off course, the Primary sings softer. If they are on the right course, the Primary sings louder. Repeat until each child gets a turn or time runs out. Jr. Primary: Play the exact same way as Sr. Primary but omit spinning. Those little ones will have a hard enough time without being dizzy! I also sing this song in nursery each week! Find details HERE. Thank you so much for posting links for the temple and angel Moroni. I've been wanting to do this but hadn't taken the time to find those. I love your blog, thank you! In the July Friend their is an awesome illustration of a SLC Temple in squares that could be used for this game or as a puzzle. If you blow each square up about 300% it fits a standard paper. Three years later and your wonderful idea is being used by me! Thank you so much for sharing! Thanks for the leas to the July Friend! I am using it now in 2014!